The University of Notre Dame holds its Notre Dame Elite ID Camp this summer for male soccer players between 10th-12th grade, who’s looking to be challenged and develop their skills. The camp is open to any and all participants who meet the requirements of age and gender. The camp will take place at the University of Notre Dame’s campus in South Bend, IN. The University of Notre Dame was founded by a priest of a French missionary order in 1842. His idea was to create a great Catholic university in America, this vision is what the university has grown from and stayed loyal to until today’s date. Notre Dame is also known as one of America’s leading undergraduate teaching institutions as well as being in the front of research and scholarship. The aerodynamics of glider flight, the transmission of wireless messages, and the formulae for synthetic rubber were discovered and developed at the University. Today Notre Dame fosters researchers who’re achieving breakthroughs in astrophysics, radiation chemistry, environmental sciences, tropical disease transmission, peace studies, cancer, robotics, and nanoelectronics. The students not only learn to think, but also how to live at Notre Dame, through unique experiences on campus the students get the real Notre Dame spirit with them many years after they finish their studies. Notre Dame Elite ID Camp staff consist of experienced high-quality top college coaches from around the country. Current Notre Dame players will also be attending the camp. The coaches from Notre Dame are committed to the ideals of the university and create student-athletes with a championship caliber. Head Coach Bobby Clark has been the Head Coach of the Fighting Irish for the past 16 seasons. He guided the team to the 2013 NCAA title the first for the program, achieving a new winning record every season and latest, winning the national championship. Associate Head Coach BJ Craig has helped produce seven All-Americans, 36 all-conference selections, four conference players of the year and 22 MLS draft picks. Assistant Coach Michael Casper joined the Fighting Irish in 2016, prior that he was the head coach at Saint Francis. During his time there he mentored 24 all-NEC players, 15 National Soccer Coaches Association of America (NSCAA) all-region performers and an NSCAA All-American. Notre Dame Elite ID Camp program is made to challenge high-level male soccer players by playing under pressure in all situations on a daily basis. The campers will be exposed to the next level of soccer. The camp will focus on improving each player’s ability to deal with game conditions through competing in one of the most competitive camp atmospheres in the country. Superior staff will be teaching the campers advanced techniques and tactics. There will also be special sessions, including selecting a college, strength & conditioning, as well as sports psychology, which all will prepare players to succeed at the highest level. The camp will teach the campers the difference between a good player and a great soccer player, the individual skill and tactical knowledge and how to apply this knowledge to practice. The philosophy of this camp is that this ability can only be achieved through individual, group and team tactics, well-supervised skill development and intense training. A goalkeeper program specially designed to push goalkeepers to reach their peak performance will also be present at the camp. 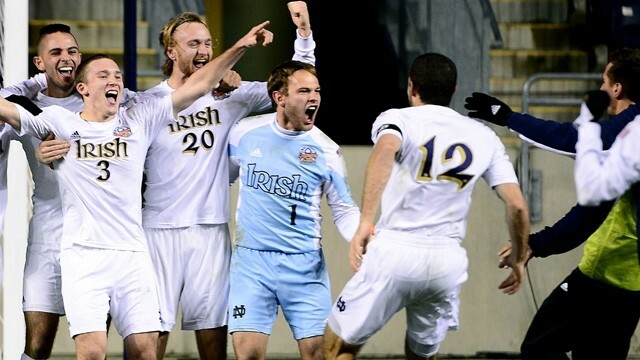 The University of Notre Dame holds its Notre Dame Elite ID Camp this summer for male players between 10-18 years old. Training is led by high-quality high school and college coaches.